Margot, researcher, author, former practitioner and instructor of taxidermy engages her audiences in thoughtful dialogue about the history and current status of the craft/art of taxidermy and our relationship to mortality. The shocking truth about being a “woman” taxidermist is that it’s not shocking at all. I get called a lot of things by taxidermy enthusiasts, animal-rights activists, and the media. 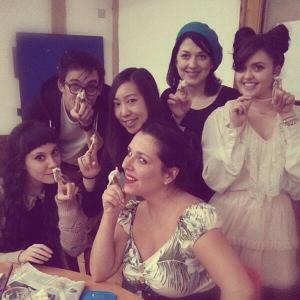 I’m apparently an instructor, an expert, a hipster, an animal hater, a sicko, a stuffer…but one of the most puzzling things I have been called recently is a “woman taxidermist” and I get asked the same question time and time again “Why are so many women taking up the taxidermy classes?”. Well why are we so shocked by this? Is it *really* that weird that I’m a woman AND a taxidermist, and more women than men tend to take my course? It’s really not! Popular culture and social conditioning would train us to think so, and that it somehow matters, but in all honesty, I don’t think it’s as much of a shocker as other people want to believe, and probably not for the reasons you think. Over 70% of my classes are made up of women. Personally I think that’s an interesting tidbit of information and fuels an enthralling conversation about gender, culture, history, and presumed roles. It is important not to gloss over the actual historical facts about women’s roles, but given the short amount of time I’m usually given to respond to such questions in interviews, any generic answer gives people the wrong impression about taxidermy being a crafty woman’s art. Has the face of taxidermy itself changed over time? Yes. It caters to more people now. More availability and exposure has changed the old perspectives about taxidermy being for trophy hunters or as examples of wealth. We don’t collect it in the same ways we used to, and the idea that it is something anyone can try and practice is brand new. 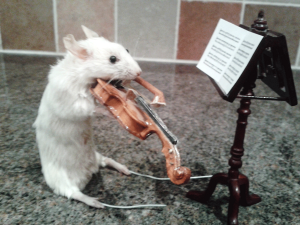 With these recent changes in the practice and distribution of the availability of taxidermy and classes, and the fact that a lot of classes handle smaller animals, has taxidermy become a female-oriented art and craft? I think this is too easily presumed and is way too-short-of-an-answer. People seem to like to think that women are better at handling small, fragile, and detailed things and are of the general disposition to love arts, crafts, and fashion, while the sweeping generalisation is that men like technical applications and might join the course for the anatomy lesson or because of their curiosity about natural history or because there are lots of good looking ladies who attend (and yes, this is also offensive to men in my opinion…). Well, let me tell you that neither men or women seem better in my classes, they are both equally as heavy handed, often tearing limbs off or rubbing skin until it is absent of fur. Most of the pieces have that same first-timer’s raggedy look about them despite the gender of the student (or the mouse for that matter!). In my experience men and women are both equally rubbish or good at taxidermy. And it takes bloody practice (no pun intended)! Neither gender weighs heavier with success. Creativity, using props, and originality in positioning the anthropomorphic animals seems to flourish with both genders. They both get really into it. Every once in a while a true talent comes along, but this perfection is rare and is neither female nor male dominant. It’s very person-specific. Historically, the hunting, collecting, and stuffing of animals was a particularly male dominant role, but we can’t forget that females who may have been involved in these practises may well have been written out of this history or were seen as unimportant. Who knows if this was an important trade for women (if you do know, get in touch! ), parts of it may have well been. (Sounds like a good PhD proposal to me!). It would be of no surprise really if women were involved in skinning and preserving animals. In fact, women have historically had the role of attending to the dead. I asked Dr Lindsey Fitzharris, the Chirurgeon’s Apprentice, about the significance of this and she said that “until recently, women were the caretakers of the dead, and often dealt with death on a regular basis. Today we are suddenly surprised by the fact that women might be interested in subjects or activities relating to the dead – that somehow we are breaking a gender stereotype.” When actually, we are not at all. Lindsey illustrates one of women’s roles in caretaking for the dead in her blog post about elderly women as searchers, or those who would examine dead bodies for the cause of death and record their findings in the Bills of Mortality (1592). A pretty horrendous job in plague-stricken England, if you ask me. Whatever you want to think women are today, i.e. women have a predisposition for liking crafts and arts, or they are more sensitive to issues around death, or are more creative, or can handle delicate objects better due to their gentle nature, or have a predisposition to liking animals, or are into the latest fashion, or that women are more likely to take classes…..these are all vast generalisations given to us by societal constructs- and not one of these alone defines neither being a woman, nor being into something like taxidermy. I don’t particularly identify myself as being a “woman taxidermist”. And I hate that so many people flock to the fact that the taxidermy courses are predominantly women. There is not a quick and easy answer and I think giving one defeats the whole purpose of asking the question. It perpetuates this idea that some things, and especially things as simple as a class, are specifically for women and other things are for men. It in the worst case makes taxidermy a “girl thing” *shudders*, excluding men from it, and it creates a disparity between genders. I’m not saying we need to completely discount the fact that more women than men take the classes. Like I said. It’s interesting and starts an important conversation about the constructs of gender. But we need to look further than the basics if we are going to analyse trends like this.